Make art out of the bare branches. I think there's something bittersweet and beautiful about trees reaching their branches up to the heavens, and it's only in winter when we can see their graceful silhouettes. Take time out for some bare tree photos. Nature's first green is gold. Hibernate with some good movies. For me, movies and photography go hand-in-hand, so I chalk up watching movies to "work research." :) Here are just a few flicks I've enjoyed lately (all VERY different! ): Moonrise Kingdom, The Light Between Oceans, Bottle Rocket, Tulip Fever, Ex Machina. Have a guilt-free nap. If the bears can sleep for months without getting hassled, there's really no reason you can't snooze through at least one winter afternoon. Light candles at breakfast. Dark winter mornings are perfect for candlelight. It's super-cozy and feels like a mini-celebration. Treat yourself! P.S. If you've got spring fever big-time and can't wait to capture the season as it blossoms, I invite you to join my next online photography course, How to Take Better Photos of Nature and the World Around You. It starts on March 5, 2018 and you don't need a fancy camera (your smart phone will do just fine). This is the only time it will run until 2019, so don't miss your chance! 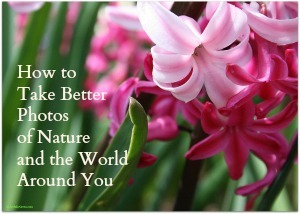 Click this link for all the details: How to Take Better Photos of Nature and the World Around You. Meet me on Instagram, where I share my newest nature photos and "mini-blog posts" almost every day at @joy_sussman. Or, for my "gallery of creative experiments" on Instagram, check out @joyundefined . Sign up below for my FREE monthly(ish) photography newsletter, Writing with Light, where I share my latest creative inspirations, occasional freebies, upcoming e-courses, and exclusive discounts. When you subscribe, you'll also get my free downloadable guide, "Hey, How Did You Do That?!" 20 Apps to Totally Transform Your Phone Photos. © 2018 by Joy Sussman/JoyfullyGreen.com LLC. All rights reserved. All photos and text digitally fingerprinted and watermarked. Please do not use any photographs without asking me first for permission at JoyfullyGreen.com@gmail.com and then clearly linking back to this site with photo credits. Site licensed by Creative Commons. The photograph in this post (I call it "Pink Blooms") is available as an art print (framed or unframed) in my Society6 shop. Next nature photography e-course coming in July! Email me at JoyfullyGreen.com@gmail.com to get on the list for early details or to reserve your spot. © 2014 by Joy Sussman/JoyfullyGreen.com. All rights reserved. Photo digitally fingerprinted and watermarked. Site licensed by Creative Commons. The past week here on the eastern coast of the U.S. has been a smorgasbord of "bad" weather--fog as thick as pea soup (more like mushroom soup, based on the color), chilly rains, snow flurries, ice storms. It's enough to send a person into hibernation. And yet...it's a photographer's dream! When the weather is a drama queen--a diva to put even Mariah Carey to shame--it's the best time to seize the camera and get out there. Although I often post-process my photographs (one of the things I'll be teaching in my upcoming photography e-course), the colors in the photo above are unaltered. It was the combination of thick morning fog and a gray sky that gave the ruby red leaves their super-saturated glow. And those shapes! I loved how the tiny leaves of the Barberry bush acted like little spoons for the droplets. This snapshot of a tree reflected in a raindrop reminded me of a snowglobe. It was one of those happy accidents, discovering the inverted image of the tree inside the raindrop as I was clicking away. Experience winter through the words of a poet. I've always loved Robert Frost's Stopping by Woods on a Snowy Evening. Seek out more poems about winter (like Winter-Time by Robert Louis Stevenson), or put your own poetic impressions to paper. Experience winter through music. If you celebrate Christmas, carols are the obvious answer "when the weather outside is frightful." And it's hard to be a grump listening to The Nutcracker Suite or Vivaldi's Winter overture from The Four Seasons, this one set to a montage of famous winter paintings. Experience winter by reading novels set in the season. Here's a fine list of books with a winter setting, although my first recommendation would be The Lion, the Witch and the Wardrobe. It contains one of my favorite winter scenes ever, when young Lucy pushes her way through the long fur coats in the wardrobe and is shocked to find the snowy wonderland of Narnia on the other side. Every time it seems like the whole wide world is glittering with ice crystals, my mind drifts back to Narnia. Experience winter through the eyes of a child. Remember the excitement of a "snow day"? Children are bursting with positive energy in winter. Two mornings ago, after an ice storm during the night--each branch and every blade of grass encased in ice--my daughter ran to me squealing, "Mommy, the whole world is in disguise!" On snowy days, the first things that kids think of are snowmen, snow angels, snow igloos, and snowball fights. Why should there be an age limit attached to any of those things? So, embrace the season as a child would, or try to see it through an artist's eyes and be inspired to create something beautiful out of it--anything from a snowman to a poem, a wintery song to a photograph of a bright red cardinal in the stark branches, with the backdrop of the crisp, white snow. © 2013 by Joy Sussman/JoyfullyGreen.com. All rights reserved. Photos and text digitally fingerprinted and watermarked. Site licensed by Creative Commons. What's been springing up in your neck of the woods lately? How do you break through creative blocks? If you enjoyed reading this post, please subscribe to this blog via RSS reader or email (righthand column). Already subscribed? Please connect with me on Facebook and Twitter . To comment (and please do! ): If you're a subscriber, click on the blue title at the top of the post to get to the main site. Then you will see the comments section at the end of the post. Thanks for reading Joyfully Green! And just when we think "spring has finally sprung"
We wake up to flurries. Because winter isn't ready yet to say goodbye. They wink at us and whisper, "You don't know us at all." If you enjoyed reading this post, please subscribe to this blog via email or RSS reader (in righthand column). Thanks for reading Joyfully Green! Mourning Doves: True "Love Birds"
I feel like I've known the following poem for as long as I can remember, and yet I never tire of it. Robert Frost was one of my father's favorite poets, and this poem always brings back memories of the woods behind my childhood home in Connecticut. If we ventured out far enough into the woods, we would come to a long-forgotten carriage path. I love how a poem has the power to transport us back in time to a place we hold dear and the people who brought us there. If you enjoyed reading this post, please subscribe to this blog (righthand column). Already subscribed? Please connect with me on Facebook and Twitter . To comment (and please do! ): If you're a subscriber, click on the blue title at the top of the post to get to the main site. Then you will see the comments section at the end of the post. Thanks for reading Joyfully Green! © 2013 by Joy Sussman/JoyfullyGreen.com. All rights reserved. Photographs and original text digitally fingerprinted and protected by MyFreeCopyright.com. Site licensed by Creative Commons. Enjoying the Great Outdoors...Without Leaving the House? Robert Frost: Darkness or Light? Instantly Greener: Unleash Your Inner Farmer!